Not everyone enjoys the constant connectivity that First World users take for granted. So, for developing countries—and, possibly, the U.S.?—Google said it will allow many of its apps to be accessible offline. “Making the world’s information accessible to users everywhere has been at the heart of what Google does, right from the start,” said Jen Fitzpatrick, vice president of engineering, on stage at the Google I/O developer conference keynote on Thursday. First, Fitzpatrick said, the company plans to expand its Android One program. The low-cost phones based on Google’s reference designs help the company drive a standard configuration that can run the latest apps. They’re available in India, Bangladesh, Sri Lanka, Turkey, and Nepal, via partnerships with about ten hardware makers. Google’s low-cost Chromebooks are also targeted at emerging markets, with “tens of millions” of the low-cost computing devices available worldwide, Fitzpatrick said. But the overarching idea is to make Google’s apps fast, useful, and relevant, no matter where you are in the world—including developing regions, where “speed, size, and connectivity are central concerns,” Fitzpatrick said. Search and Chrome: In Indonesia, Google found that loading a search results page took 8.5 seconds on a 2G connection— and clicking on a result could take 25 seconds more and use a megabyte of data. So Google launched a version of Search that’s ten times smaller and 30 percent faster, starting in Indonesia. Search results launch four times faster and use 80 percent fewer bytes. 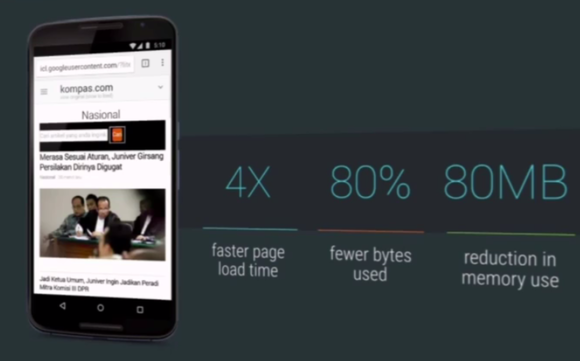 Google’s optimized search results load fast when they need to. In India, the company is deploying a network quality estimation service. If you’re surfing the Web on a low-fidelity Internet connection, Google will show you a web page with reduced image quality, to save bandwidth. Images will, in some cases, be replaced by placeholders. And yes, there will be offline acceess. “This means that you’ll be able to save any page you’ll visit...for later,” Fitzpatrick said. YouTube Offline: In India, Indonesia, the Philippines, and Vietnam, Google has launched YouTube Offline, where users can cache a YouTube video for up to 48 hours on their phone without an active Internet connection. Maps: Although HERE and other services have made offline maps increasingly popular, Google’s been behind the curve. Google’s Fitzpatrick said they’ve been adding more public transit options in areas of the world like Sao Paulo, Brazil, and the company is working to take those map options offline—even things like the opening hours of a museum, as well as turn-by-turn directions. The real question is whether Google takes these low-bandwidth options, and brings them to the United States. Because while companies like Verizon are working to make cellular connectivity pervasive, it’s not totally everywhere.